Boston Ballet in William Forsythe's 'Playlist (EP)'. Photo by Angela Sterling, courtesy of Boston Ballet. How does watching dance make you feel? Well, you might say, it depends on the work. 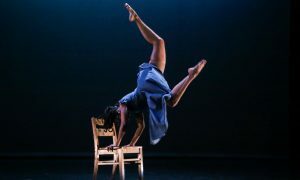 That response is getting at mood, the feeling a work of dance evokes — which most often choreographers seek to build, successfully or less than successfully. Boston Ballet danced three works of William Forsythe in Full on Forsythe, each with its own distinct mood. As a visual artist, and costume as well as lighting designer for these works, iconic choreographer William Forsythe showed his penchant for creating such clear moods in each work. The dancers’ performances, as key building blocks of this mood, were just as commendable. Derek Dunn in William Forsythe’s ‘Blake Works I’. Photo by Angela Sterling, courtesy of Boston Ballet. 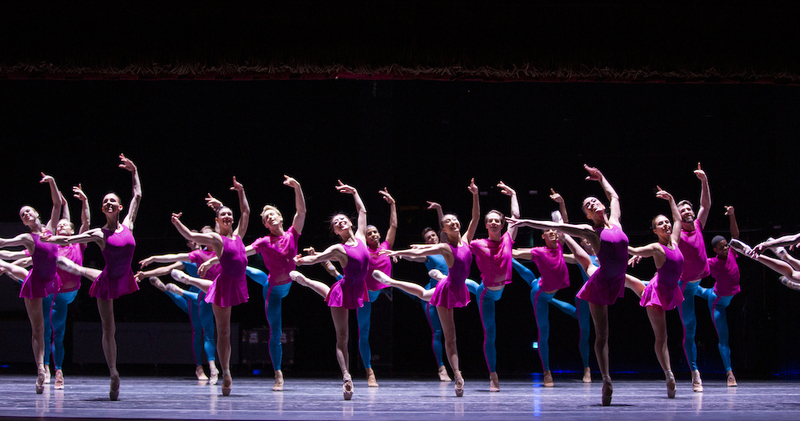 Act II offered Blake Works I, a Boston Ballet premiere (world premiere in July of 2016, with the Paris Opera Ballet). An airy, dreamy score ushered in the first section, “I Need a Forest Fire”, with a song of that title. Much of the music throughout the act was similar, with some tunes a bit more jazzy and upbeat. Movement had a compelling licking and lapping quality, with an oozing smoothness. At the same time, there was a mournful quality to it — with the sense at grasping at something one loves, while fearing losing it. This aligned with the subject of most of the songs, love and loss in romantic relationships. Interestingly, there were access points to life in 2019 and how that affects relationships — for example, the second section was “Put That Away and Talk to Me”, with it implied “that” being a cellular phone. Movement in this section had urban/hip hop dance qualities, such as accentuated hip movements and angular (rather than classically rounded) port de bras shapes. This seemed to honor the music as “Rhythm and Blues”, which made me smile to see. 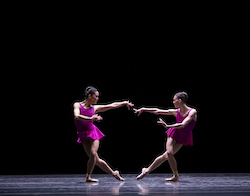 As is characteristic of Forsythe’s style, the stage picture constantly shifted and changed — trios into duets into septets into larger group sections. It all just kept buzzing with action. The phrasework was just as full, varied, and complex. It was also often quite fast, and I wondered if more pauses and tempo changes could make the fast and fabulous within the movement easier to truly appreciate. Some of the most successful moments in the piece, arguably, were in those relatively rare moments when these pauses and slower speeds did occur. For instance, in that second section, lines of danseurs entered, walking toward centerstage. On a strong and repeated upbeat in the music, all together they looked towards the audience, gazed for a breath, and then looked back towards centerstage. It was perfectly accessible, memorable, and pleasing. 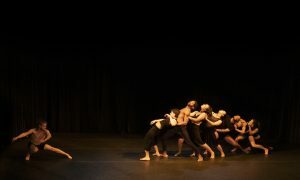 “The Color in Anything”, danced by Chrystyn Mariah Fentroy and Roddy Doble, had varied tempos in both movement and music. “I Hope My Life” followed, opening with an explosion of energy and remaining quick and powerful — which felt striking and impressive given the tempo and feel of the section from what we had just come. What felt undeniably successful and pleasing, all throughout, were costumes and lighting. Simple cuts of simple light blue costumes were in easy harmony with the slightly darker blue and light purple lighting. 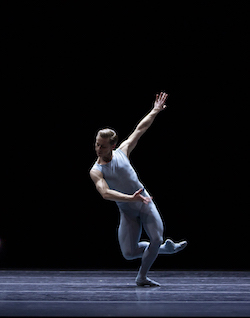 Forsythe also designed lighting and costumes (for this piece and all other pieces), and — combined with the luscious movement — his aesthetic vision was clear. That aesthetic vision helped to fully realize a soulful, deep mood. I was ready to clutch at my heart right in the theater and think about love and loss in my own life. It seems to me that’s one sign of something successful happening in art — for it to lead audiences to meaningful self-reflection. Lia Cirio and Viktorina Kapitonova in William Forsythe’s ‘Playlist (EP)’. Photo by Angela Sterling, courtesy of Boston Ballet. Act III, the World Premiere EP – Playlist, felt like a great choice for the show’s closer, because its distinct mood was groovy and fun. A clear aesthetic vision also felt salient in this act, darker blue and magenta costumes harmonizing with shades of blue and purple in lighting. Movement was luscious yet technically intricate, with social dance signatures that honored the identity of the music, just like that of the Act II. Yet there was an additional sassiness to fit with the loud and proud feel to the music. To open, in the “Surely Shortly” section, dancers shifted side-to-side, led by their shoulders. This developed into arms reaching up and over, and into traveling turns. It felt like a building, growing cyclone. I experienced this as quite a compelling and pleasing effect. Still, overall, it felt like some slower tempos and moments of could have made the striking athleticism within the piece even more striking, to make the impact it felt capable of making. As such, a soulful and romantic duet danced by Fentroy and Doble, “Location”, felt quite satisfying in its contrasting slower speeds and sweet moments of pause. Hips hit musical accents, moving back and forth in space. I wondered how this might work more times, as a motif. At other points, it seemed like a conversation in movement was building, such as call-and-response in turning and a turn from the other to follow, back and forth in sequence. The ending was sweet, the pair walking off with her arm on his shoulder. Another duet, with Kathleen Breen Combes and Jon Lam, was both carefree and soulful. Their technical command seemed to be at a place where they can just breathe and be in the movement, its quality and beauty shining through. The whole company gradually entered, to offer a finale to truly remember. Somehow, even with the many dancers on stage, lines and shapes stayed clear. Colors oozed and blended, but the blues and magentas were somehow all still distinct. The energy in the theater was palpable, as all clapped along. All seemed to share in joy, sass and soul on stage. Lasha Khozashvili, Patrick Yocum, and Jessica Burrows in William Forsythe’s ‘Pas/Parts 2018’. Photo by Angela Sterling, courtesy of Boston Ballet. The first act offered Pas/Parts 2018, also with its own mood — stormy and tense. Atonal parts of the music, movement hitting its accents, and Forsythe’s characteristic constantly shifting action helped create this sense. A scarcity of pauses and slower moments was present in this act, too, yet seemed to be the most effective for creating its mood as compared with this quality in the two other acts. All in all, three different moods were clear in three different acts full of diverse, impressive movement. 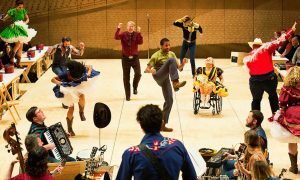 Technical effects, which Forsythe himself designed, helped further build these moods. Specific feelings in audience members can lead to thought and reflection, and that in itself can be an artistic achievement.